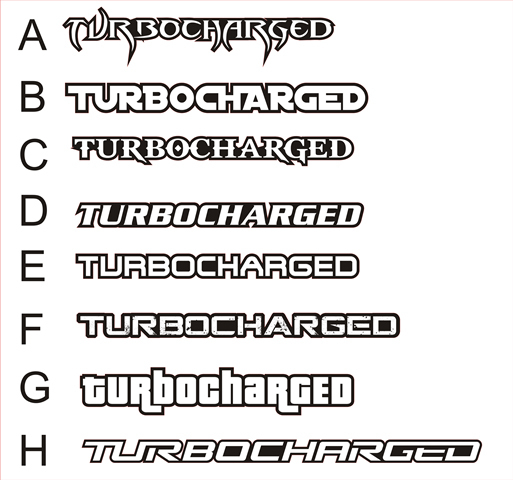 This is a general use TURBOCHARGED emblem for your turbocharged vehicle. We allow you to choose a font style, and color combination. We have given some recognizeable fonts to choose from. Star Wars, Blade, Gears of War, Grand Theft Auto, Terminator, God of War, etc are some of the styles we use. Simply choose a style from the dropdown box, and a color combination from the dropdown box and we will get it made for you. These emblems are made from UV Rated outside material, and they are laser-cut and engraved. They come with 3M Double-Sided Automotive Tape pre-applied to the back side. Simply clean the car where you intend to place the emblem, peel the liner off, and stick into place. Style A is approximately 1.25" x 5.5"
Styles B through F are approximately .5" x 6"
Style G is approximately 1" x 5.5"
Style H is approxiamtely .5" x 8"